The Rawlings Foundation, Wellington, FL, 2011. This book is very readable while giving the reader an in-depth look at the development of the English Bible, particularly focusing on its history from Wycliffe to the translation of the KJV. Some of the intriguing information included is the influence the creation of the English Bible had on the English language itself. 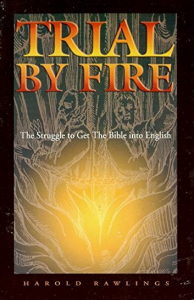 In addition to learning fascinating twists of history influencing the formation of the English Bible, one gains a greater insight into the tortuous path our spiritual ancestors endured to bring us the Word of God in a language English-speaking individuals are able to read and comprehend. The translation of the Bible into English has subsequently been a major force in the further translation of the Bible, in whole or in part, into nearly 3,000 languages.